La Nina is here but it’s on the weaker side as of September. What is La Nina? It is a cooling of the water in the equatorial Pacific that occurs at irregular intervals and is associated with widespread changes in weather patterns complementary to those of El Niño, but less extensive and damaging in their effects. We see this weak La Nina to peak now but get a second burst in December and January before moving to a neutral pattern Febraury and March. 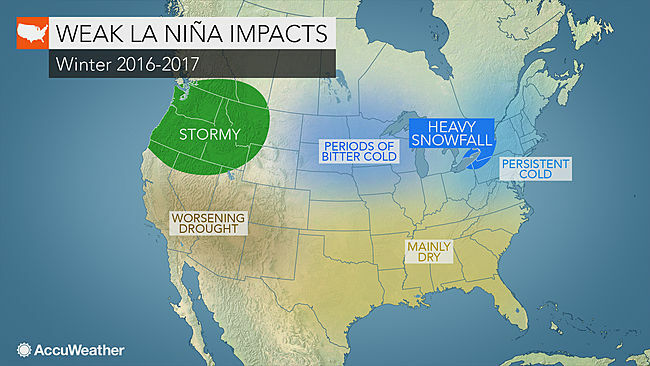 This weak La Nina means a colder winter for most of the nation and certainly much colder than last winter. The key to this winter will be how cold is the cold and how dominate will the Northern Jet (Arctic Jet) be vs. the moisture loaded Southern (Sub-Tropical Jet)?. Last year the Southern Jet was the big player off a massive El Nino but this winter that will not be the case most of the country. We expect an average swing of the NAO (North Atlantic Oscillation) but much more of a dip from the AO (Arctic Oscillation) bringing a few polar vortex periods and many Alberta Clippers. 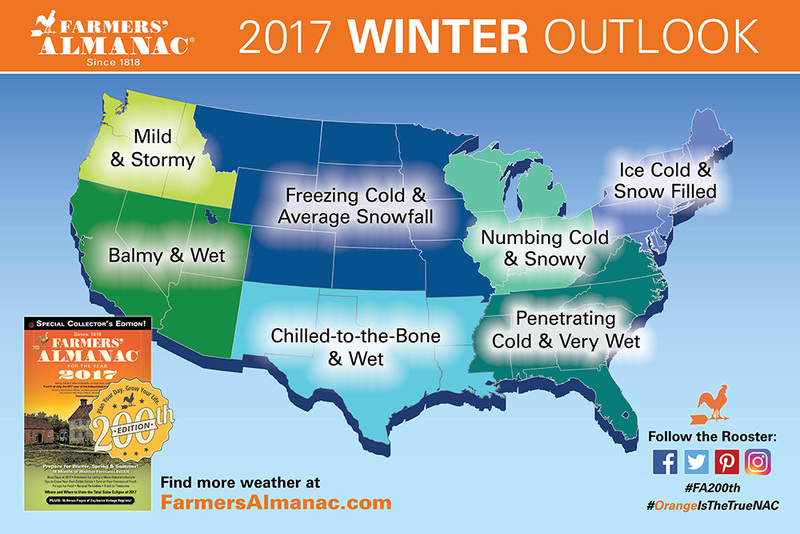 Now, just to show you how different forecasts can be, take a look at the Farmer’s Almanac below. I’m still trying to figure out exactly what it means. I guess “penetrating cold and very wet,” means a greater chance for snow/ice? Hmm. Your guess is as good as mine. 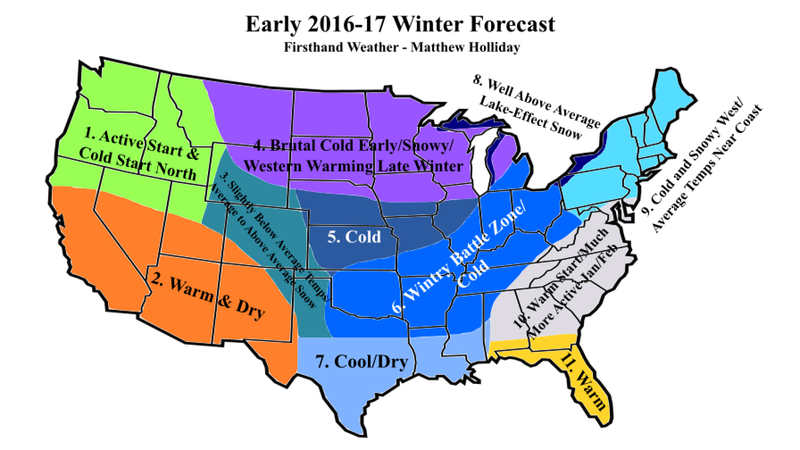 Region 4, which is in the Southeast Region and includes portions of Georgia, North Carolina, South Carolina, and Virginia, is predicted to have a winter that is warmer than normal with near to below-average snowfall and other precipitation for winter 2016-2017. So, you know what? Your guess is as good as mine! I hope you enjoyed the early look at Winter! Pray for us as we (Dale Jennings, Kandace, Clara and myself) head out to the Philippines that we may share the love of Christ and see many lives changed and impacted for Jesus! 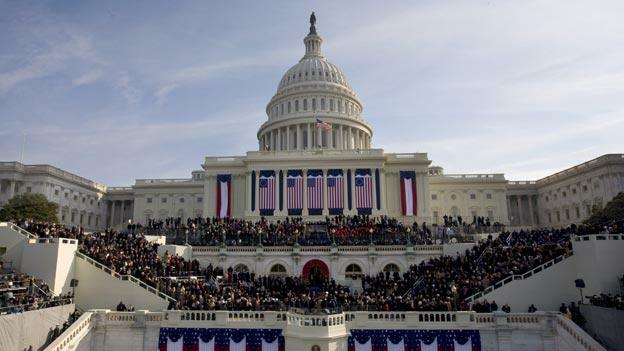 In about 3 1/2 months all eyes will be on the US Capitol. 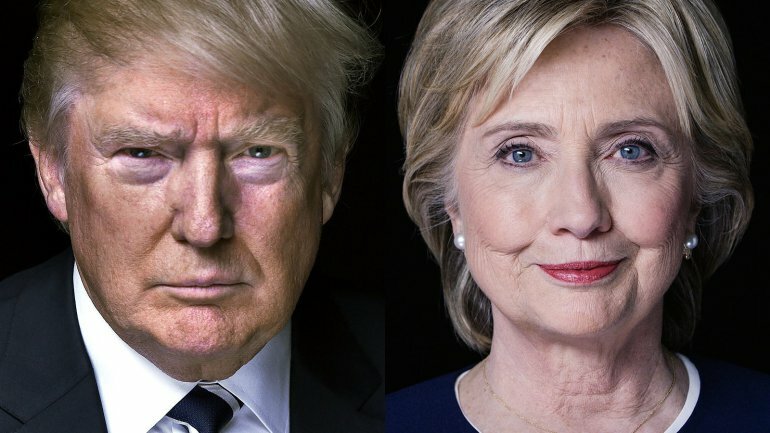 On Friday, January 20, 2017 in about 3 1/2 months there will bean inauguration of a new President in Washington and it’s going to be one of these two people. There is NO DENYING that! Believe me…I don’t like the choices we have. I’m so disheartened to be honest. Yet, in my humble opinion, we only need to look in the mirror to find who we need to blame. As a Church in America we’ve been asleep at the wheel. We are now reaping the fruit of years of apathy and compromise. Well folks, if we don’t stand up this time and exercise our freedom to protect our freedom, I’ll tell ya something…we’re going to lose it all! At the rate things are going, we are not going to have the freedom to continue to openly share our faith in this culture. We may one day be worshiping “underground,” like the catacombs of the first and second century Christians. Please read carefully what I’m about to say: Only God can turn America around, our problem is not political…it’s spiritual. But, this election, in my opinion, will have the most significant impact on whether or not our country can regain its moral standing. Let me remind us of how tight it was in 2012 with Romney and Obama. Romney lost Florida by only 73,000 votes out of 8.3 million cast. He lost Virginia by only 115,000 out of 4 million. He lost Ohio by 103,000 out of 5.5 million and New Hampshire by only 40,000 out of 700,000 cast. Folks, if Romney had one those four states…just those four states…he would have been president and not Obama. Let that sink in for a moment. Out of 18.5 million votes in those four states, Romney lost by 1.8% or 333,000 votes. Again, if he had won those states, he would have picked up 64 electoral college votes and won the election 270 to 268 in the electoral college. Why did he lose? You pick the pundit and you pick the study, but most say Romney lost because Evangelical Christians didn’t come out and vote. Listen… the last 8 years have been devastating on this country. The Obama Administration and it’s left-wing, progressive liberal policies have continued to strip away our religious freedoms. Who could have imagined we’d be debating whether or not men, who feel like women, should be allowed in our wives’ and daughters’ bathrooms. Yet, Obama and his cronies are more interested in combating supposed discrimination in our bathrooms than getting our country back on track. So, here we are folks and either Trump or Clinton is going to be taking the oath of office in 3 1/2 months. Again, I don’t like it any better than you do, but it’s all we’ve realistically got to choose from. No other candidate has a chance of winning. Now I understand and I respect those who choose not to vote November 8th. I truly do. However, in taking that “moral high ground,” please understand that won’t change the fact that either Clinton or Trump will be raising their right hand and taking the oath of office on 1.20.17. That’s a fact. 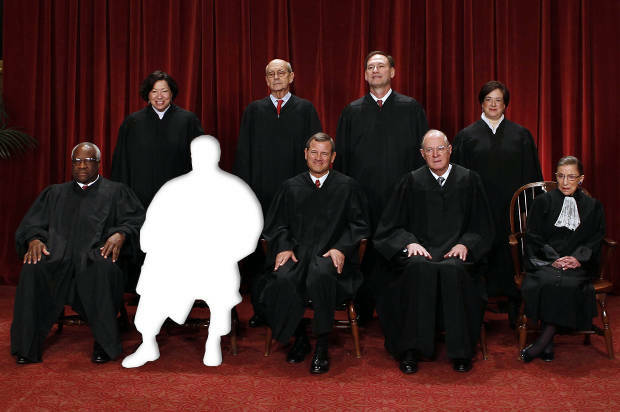 That’s Antonin Scalia’s spot. He died several months ago, leaving the court split at 4 to 4. There are 4 liberals and 4 conservatives on the court. And folks, it’s those folks who will decide things like HB2. Those folks are the “kings” of this country right now. So, here we are folks and either Trump or Clinton will fill that spot and not only that spot. But, most believe the next President will fill 2-3 more spots, (because of the age of several of the justices), in their term. Do you understand what a liberal court will do? 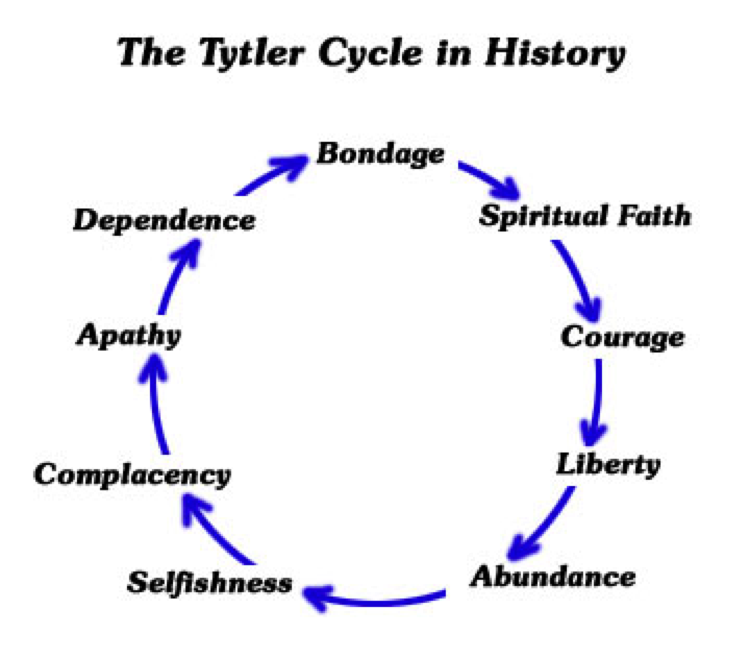 They will strip away every vestige of public Christianity in this country and given time, Christians will be locked up for preaching and teaching orthodox Christianity from the Bible. Mark it down! Trump has put forth several names of potential justices. They have been vetted by strong Christians who say that the names put forth by Trump are very conservative judges. I know, I know…how can we trust Trump? I get that. But, HOW CAN WE TRUST CLINTON! Remember, those are our two realistic, legitimate options at hand. We all know who Clinton will appoint. Just read the Democratic platform, It’s a godless platform and parts of it are just plain evil. Without question, Clinton would appoint some of the most left-wing, progressive liberals you’ve ever seen in your life and well…it’s all she wrote then! But you see, I don’t worry about me. 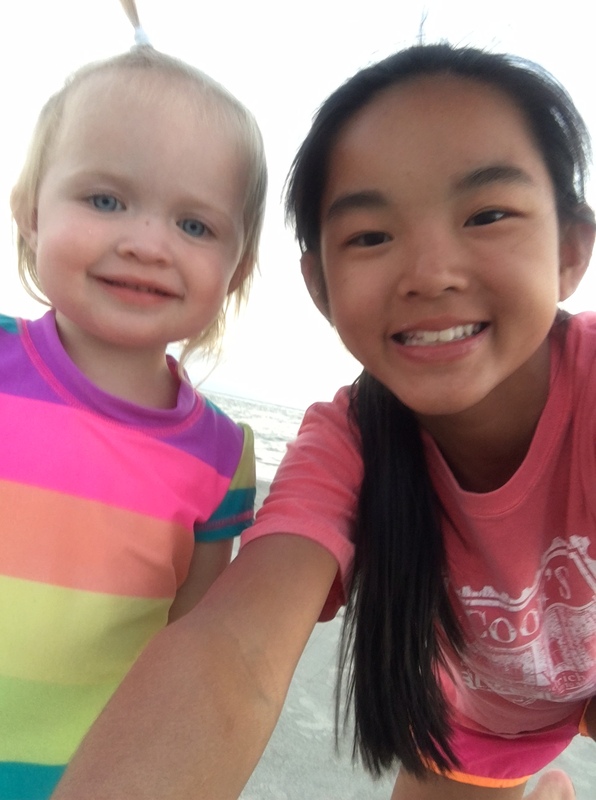 I’ve lived a very good life… I worry about them… That’s my daughter and granddaughter. They are the ones who will have to live with my decisions and the decisions of this country. And might I say, I feel like Nehemiah. I’m going to fight for my wife and my children.